Torrington, Alberta's Claim to Notoriety! It's easy to think of Banff and Jasper when you think of Alberta, and it would be hard to find a more beautiful place than the Canadian Rockies for a roadtrip in July. But Alberta has far more to offer than turquoise lakes and hanging glaciers. I decided, as I headed south from Edmonton to Spokane, Washington, to travel the prairies instead of taking the mountain route. It was the name of Driedmeat Lake that attracted me to highway 21, but I never did find the body of water with that intriguing name. Instead, I kept rolling south through New Norway, Bashaw, and Mirror, admiring the yellow canola fields and picturesque farms. It wasn't until I decided to head west on highway 27 that I caught sight of a sign too enticing to pass by. "World Famous Gopher Hole Museum," it read, and a marketing genius couldn't have come up with a better come-on. It must be some gopher hole to achieve global recognition, I thought, and I applied my brakes forthwith. The museum is easy to find, thank to the plywood cutout gophers stationed along the most direct route, which also guides visitors through Torrington's "downtown." The museum is housed in a tidy white cottage with a tall flagpole in front. I was still wondering where the gopher hole might be (under the floorboards, maybe?) as I stepped into the gift shop anteroom of the museum, but Angie Falk, the volunteer staff member on duty for the day, was quick to explain the museum's name. "We are world famous," she said, pointing to a large map of the world studded edge-to-edge with round-headed pins. "You can see where our visitors have come from in the five years since we opened." Sure enough, someone from Tierra del Fuego had visited the Gopher Hole Museum. As for the hole, well, things get more interesting when you pass into the museum proper, a separate room with low lights and forty or so dioramas housed in neatly constructed wooden boxes. While, strictly speaking, they aren't holes, they are most definitely populated with gophers, three dozen or so of the cute little critters. 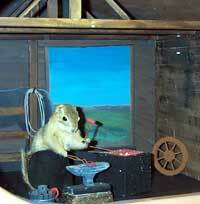 And now for the real secret behind the Gopher Hole Museum's global reputation. The gophers, having long since drawn their last breaths, are stuffed and clad in costumes that reflect the theme of their "hole." There's a Canadian Mountie , for example, and a hairdresser. Most of the "holes" depict local businesses and culture, like the fertilizer factory, the Indian village, and the Lutheran Church. 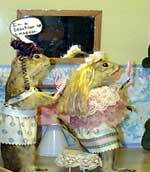 The taxidermy is of professional quality, as are the background murals in each of the dioramas, painted by Alberta artist Shelley Haase. Every visitor gets to decide, and one look at the fat notebooks full of newspaper clippings and letters from guests is all it takes to know that the museum draws a lot of comment. The majority, I noted as I leafed through the growing archive, are supportive. Most people like the idea that a tiny village has succeeded in its dream to create a unique identity. 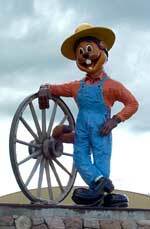 There's no doubt that the World Famous Gopher Hole Museum is unique, and Torrington also may be the only town boasting a twelve-foot statue of a smiling gopher wearing overalls. 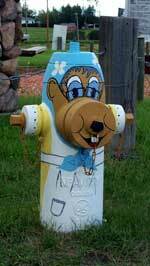 The fire hydrants in town promote the theme, too, each one individually named and painted to look likeyou guessed ita gopher. 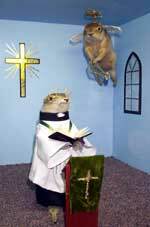 As I drove south, I noticed more gophers on the road than I had before, and I swerved to avoid hitting one that ran in front of my tires. Was I villain or hero? 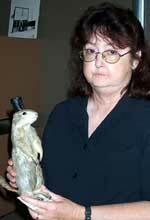 Hard to say, now that I've been to the Gopher Hole Museum. I've gained new insight into the love-hate relationship between Torrington and the cute little crop-destroying critter that brings her fame.